Too often in education, education groups' pursuit of validation for their policy priorities and the media's desire for a strong narrative lead them to whip up a public frenzy at the expense of accuracy and nuance. That's certainly what happened with states' rapid retreat from testing as well as their sudden distaste for the Common Core standards. It's why state legislatures continue to fight for class size reductions even though the adjustments are always too marginal to have any real impact on learning. Reprinted from Sutcher, L., Darling-Hammond, L., & Carver-Thomas, D. (2016). A coming crisis in teaching? 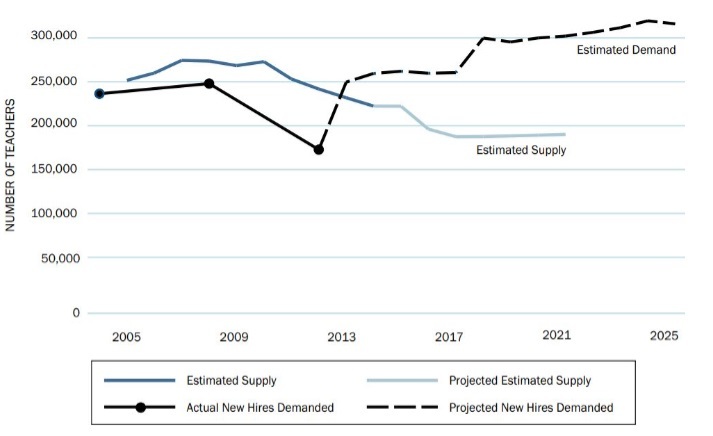 Teacher supply, demand, and shortages in the U.S. Palo Alto, CA:Learning Policy Institute. page 2. It's almost 2018, folks and while LPI's dire predictions rested on one set of assumptions, we now have actual data that showed that their projections were way off. 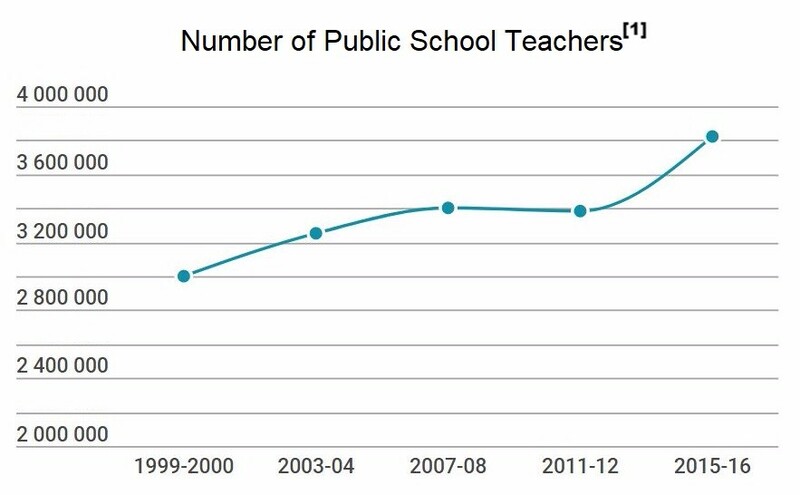 The newest data out of NCES show that our public school teacher workforce is not shrinking but growing! In 2015-16, the estimated number of teachers reached over 3.8 million - an increase of about 400,000 in four years. Moreover, based on 2015-16 projections, the number of students probably hasn't grown nearly as fast as the number of teachers. Education Week reports, "The number of students went up about 2 percent over four years. And the number of teachers went up 13 percent during that same time." Check out this great graph from Education Week illustrating this change in population. It clearly shows a dip after the Great Recession, but since then, contrary to the fears of those claiming a nationwide teachers shortage, the teacher workforce has grown at a much faster rate than the student population. Reprinted from Loewus, L. (2017). Teaching Force Growing Faster Than Student Enrollment Once Again. Education Week. Of course, none of this is meant to deny the existence of severe shortages in some places or in some teaching areas. What it DOES mean is that, overall, there is not a new national teacher shortage. See our recent shortage fact sheet for more information. We still don't know why this increase has occurred. Possible explanations include that more people may be completing teacher preparation programs, that current teachers may be staying longer, that the student population may be growing, or that states are hiring more teachers through emergency certifications. Unfortunately, one of the dangers of trying to solve the chronic misalignment of teacher supply and demand by erroneously labeling it a national teacher shortage is that the resulting remedies are all wrong. Of course, states and districts need to address their very real struggles recruiting teachers in some fields and localities. Still, in order to develop rational and effective solutions, leaders need a clear and accurate picture of the problem - and not a flawed, worst-case scenario. For instance, districts may reject the idea of paying higher salaries to all teachers as unaffordable. But, they may be able to afford paying higher salaries specifically to teachers in shortage fields and location. Similarly, states may react to the shortage mirage by authorizing poorly qualified emergency certified teachers, rather than improving reciprocity to make it easier for teachers to move into the state. Teacher preparation programs, working on the assumption that a national shortage means plentiful job opportunities, may wind up preparing teachers for overpopulated fields like elementary education instead of recommending would-be teachers also obtain certification in special education or ESL. So, the bottom line is, the teacher workforce has grown in the last few years. Now these researchers and analysts have a responsibility to acknowledge that their fears have not come true. Those who allow the media to perpetuate inaccurate stories are doing a disservice to school districts and their students across the country. 1. Data Sources: U.S. Department of Education, National Center for Education Statistics, Schools and Staffing Survey (SASS), "Table 209.20: Number, highest degree, and years of full-time teaching experience of teachers in public and private elementary and secondary schools, by selected teacher characteristics: Selected years, 1999-2000 through 2011-12." Retrieved 25 August 2017 from: https://nces.ed.gov/programs/digest/d15/tables/dt15_209.20.asp. Taie, S., and Goldring, R. (2017). Characteristics of Public Elementary and Secondary School Teachers in the United States: Results From the 2015–16 National Teacher and Principal Survey First Look (NCES 2017-072). U.S. Department of Education. Washington, DC: National Center for Education Statistics. Retrieved 25 August 2017 from https://nces.ed.gov/pubsearch/pubsinfo.asp?pubid=2017072. Coverage of teacher shortages tells of real struggles faced by districts, but it only tells part of the story.